Adderall is an amphetamine used most commonly as a medication for attention deficit hyperactivity disorder and narcolepsy. It works by directly targeting dopamine in the mesolimbic reward pathway. Adderall works by binding to monoamine transporters in the pathway and thus increasing levels of dopamine, norepinephrine, and serotonin in the system. Adderall works not only by increasing the release of more neurotransmitters into the synapse, but also by delaying their time in the synapse by slowing down their removal. Especially in a college setting, Adderall seems to be widely used as a performance enhancing drug used to increase concentration. According to a study in 2005 in the journal Addiction, about 25% of students on college campuses (both undergraduate and graduate) use non-prescribed stimulants to enhance function. My preliminary research made me wonder, how is a drug like Adderall used by students to enhance their learning and studying abilities? Furthermore, how does it work in the brain to elicit this high performance outcome? Amphetamines like Adderall are primarily releasers of dopamine, norepinephrine, and small amounts of serotonin. At higher doses, they have also been seen to inhibit the reuptake of dopamine and norepinephrine, but not to the levels of cocaine. Dopamine has been thought to play an important role in memory formation whereas norepinephrine is linked with increased attentiveness and arousal. Amphetamines have been seen to be associated with feelings of alertness, elevation of mood, drive, ability to concentrate, and euphoria. The first step in the mechanism of action of amphetamines like Adderall is the rate limitation of tyrosine hydroxylase to convert 1-tyrosine into 1-dopa, which begins the production of dopamine, norepinephrine, and epinephrine. Amphetamine also works to inhibit the enzymes monoamine oxidase A and B in substantially high doses. These enzymes are primarily used for the breakdown of neurotransmitters like serotonin, dopamine, norepinephrine, and epinephrine. 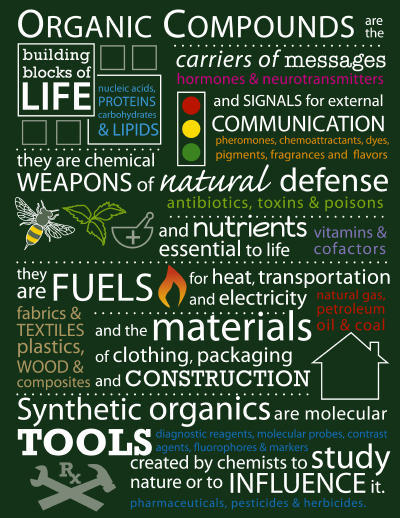 This results in the accumulation of neurochemicals in the synapse. Figure 1. 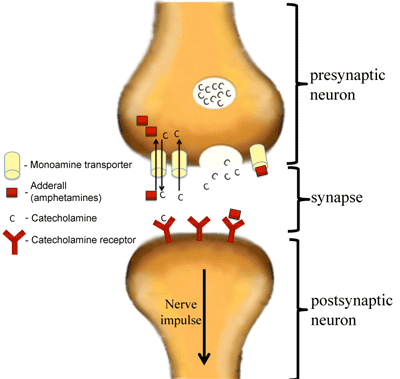 Below is an image depicting Adderall binding to and blocking monoamine transporters in the neuronal synapse. Monoamine transporters function in the reuptake of neurotransmitters from the synapse. Figure 2. This is a picture of the structure of Adderall. The mesolimbic pathway that Adderall is involved with is strongly linked to feelings of reward and desire and thus has been shown to be involved in the onset of disorders like depression, addiction, and schizophrenia. The mesolimbic pathway begins in region knokn wn as the ventral tegmental area of the midbrain and connects to the medial prefrontal cortex and the limbic system (shown below). Studies have shown that mice that have had their ventral tegmental areas removed have not shown a loss in learning abilities, but rather a loss in the motivation to work for any particular reward. Dopamine, which is the main candidate involved in the mesolimbic pathway, has thus been heavily studied in its effect on attention. It has been understood that a lack of dopamine stimulation has been a key factor in disorders like ADHD and ADD. Adderall works to relieve this problem by stimulating dopamine and also by releasing dopamine reuptake inhibitors. Figure 3. The life cycle of a normal neurotransmitter. Figure 4. The structural similarity between Adderall and Dopamine (highlighted in blue). It shows how Adderall can be used to bind to the same receptors as dopamine. Based off of these findings, I would speculate that increasing the levels of dopamine in a regular student would similarly work to improve their attention on a particular topic. As of this far, I would think that Adderall works to increase dopamine (or decrease the uptake of dopamine) which thereby increases the motivation that students need to complete the task at hand. The problem with drugs like Adderall is that they can become habit forming and can lead to severe consequences like heart problems, sleep deprivation, and most commonly, addiction. Amphetamines are classified as Class II medications, which means that they can have the potential to become addictive and abused as drugs. This is because the brain is tricked into thinking that it does not need dopamine anymore. When the reuptake receptors are blocked, the dopamine cannot become recycled and reused therefore the overall concentration of dopamine decreases causing future problems for abusers. In my quest to understand the mechanism of Adderall and its effect on concentration and motivation of a student, I also came across two other drugs that were often mentioned: Ritalin (methylphenidate) and Dexedrine (dextroamphetamine). All three of these drugs are used to relieve the symptoms of ADHD and ADD, yet I was unsure of the differences between them, and if these drugs could also be used in the same way as Adderall is. The first thing I found out was that Dexedrine was an amphetamine, while Ritalin was not, meaning that it doesn’t affect the same pathway as Adderall and Dexedrine do. Dexedrine is also composed of one amphetamine salt whereas Adderall is composed of four. This means that a much higher dosage of Dexedrine is required to elicit the same response as Adderall. However, due to the higher number of amphetamine salts in Adderall, it has also been shown to result in more side-effects than does Dexedrine. These side effects include increased heart rate, blood pressure, inability to fall asleep, and decreased appetite. Due to these effects, Dexedrine is found to be substantially safer and thus is more widely sold unlike Adderall which is only legal in the United States and Canada. Ritalin, unlike both Adderall and Dexedrine, has the least potential for addiction. The three drugs that I came across most: Adderall, Ritalin, and Dexedrine have each been shown to have a direct effect in performance enhancement, particularly in the boost of concentration and motivation that is necessary for long hours of studying and cramming. Overall, the pathways of all three of these drugs target the same thing: dopamine levels. In general, they work to increase levels of dopamine and also increase the amount of time dopamine spends in the synapse between two neural cells. Dopamine works by increasing alertness, thereby allowing a student to focus better on their work. Your post is definitely something that is prevalent in the lives of college students which makes it stand out among the other topics. Overall, I learned a lot about the topic from your post that I did not know; however, your post contains a lot of technical terms. The ordinary reader may not be able to understand, or even continue to read, your post if they do not know the meanings of the terms and processes you mention. Your post was very interesting! I learned a lot about ADHD medicines that I never knew before. I had no idea that they were so potentially harmful, nor did I know that Adderall was only legal in Canada and the US. The only real issue I found while reading your post was that, while you mentioned a few studies you never gave any real info on what those studies were. It would be helpful to put in a link to the journal articles or mention them in a bibliography so that the reader could go out and learn some more from the articles. Also, I think there was a lot of complex neuroscience language that many readers may not be familiar with. But, overall, I found your post very interesting and I really enjoyed your pictures! Good job! I found your blog to be very interesting and extremely relevant! It is apparent that this drug has been one to be abused and relied on by many college students and I have also read that ADD and ADHD are being diagnosed more often in children and young adults now than even before. This makes me wonder if everyone that is prescribed this drug truly has a deficiency in dopamine levels and re-uptake. I liked how you guided your readers through the pathway that Adderall effects and how the drug can be addicting. Also, I found it interesting that you brought up the different drugs that can be prescribed instead of Adderall as well as the pros and cons of each. I would have liked to read more about the different drugs with more detail about how they effect the body. Overall, great submission! Based on your information, it is no surprise that these kinds of drugs have such high levels of use on college campuses. It would have been interesting to see a large clinical study on the exact performance enhancing effects on normal individuals. I have a feeling that the drugs don't do anything besides increase concentration and energy to focus on a mundane task such as studying for an exam. If the drugs had some sort of intellectual or significant performance enhancing abilities I would expect the pharmaceutical companies who manufacturer the drugs to be marketing them for those purposes as well. Click on the window to enlarge. Mouseover Jmol icon to launch viewer. Red Wine: the Elixer of Life? Can Citrus Fruits Prevent Strokes?